It’s difficult to believe that we’ve already completed 3!! Ask The Expert Webinars this year – but it’s true! The first webinar covered the differences between batch mixing and continuous mixing and featured Rick Kesig, our Director of Engineering. The second webinar focused on the advantages of Variable Frequency Drives in industrial equipment and featured John Cremeens. The most recent webinar focused on the importance of PM (preventative maintenance) agreements and then went into some detail about PM’ing your mixer and creamer! This webinar was presented by two of our senior service technicians, Mr Patrick Smith and Mr. Gus Millecker. As if these were not enough – we have three more webinars planned for the balance of the year! The topics include “What’s New in Sandwiching”, “Mixer Sanitation” and the most AWESOME will be our IBIE preview webinar in September!!! You will NOT want to miss the IBIE Preview! Exciting things there! so Please REGISTER HERE for the Peerless Food Equipment Ask the Expert Webinar series! If you do miss one of the webinars, feel free to visit our Video page on our website for links to those recorded webinars! IBA 2012 – Munich, Germany! Jeff Gawka, Kroger, wins an iPad awarded by Eric Cruse. Peerless Food Equipment exhibited at IBA 2012 in Munich Germany, September 16-21st. We’d like to thank everyone who stopped by our booth this year to see us. 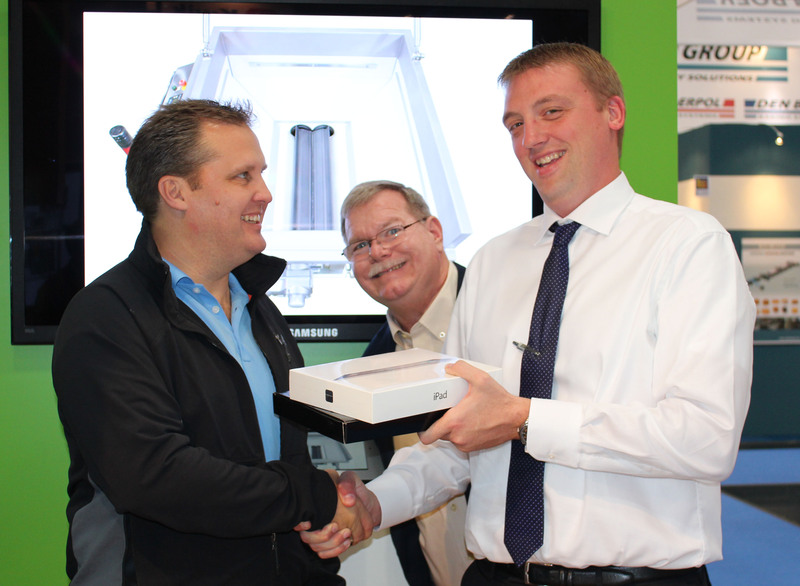 And, we’d like to congratulate the four iPad winners from the show! This includes Jeff Gawka, Kroger, John Severin, Harlan Bakeries, Ivan Cuassolo, Bagley Argentina S.A and Mohammed Ali Alabbas, Delta Modern Food Factory. This show occurs every three years and this year drew 70,000 attendees from 177 different countries. The show features 1,250 different exhibitors who cover all aspects of the bakery and confectionary market. Everything from mixing and processing equipment suppliers to ingredient suppliers to packaging equipment suppliers lined the 12 pavilions. This show has it ALL for the Bakery!This was my first year to attend this international show, and while I am quite familiar with expansive shows like NAFEM and NRA, here in the states, I really had no idea how much bigger this show would be compared to those shows in the US. IBA is HUGE!!! 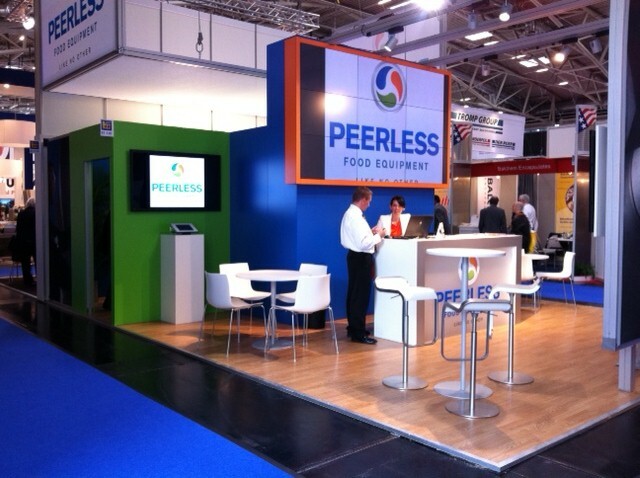 Peerless Booth at IBA 2012. The Peerless booth featured our new logo and brand look and feel. The large new logo towered over the booth and the bright colors of the booth really stood out among the stainless steel in the hall. We had a large plasma screen that displayed rotating images of our different Peerless horizontal mixers products, our Peters creamers and Fedco finishing equipment as well. The booth also featured two user controlled iPad kiosks with large screen monitors for display of images, brochures and videos of Sigma Mixers, Peters multipliers and tray loaders as well as Fedco Cooling Tunnels, Slurry mixers and Continuous Mixers. One of the most interesting part to me was the international representation of our installed customer base. Customers from China, Korea, South Africa, Italy, the UK, India, France, Canada, the US, Brazil, Mexico, Peru, Belgium, Russia, Saudi Arabia, Indonesia, the Philippines, Fiji, Argentina, Japan, Australia and New Zealand, just to name a few … stopped by to speak with us about new opportunities and to talk about their existing equipment. Horizontal mixers and creamers manufactured in Sidney, Ohio travel all over the world to support great food companies! Six days of standing from 9:30 am to 6:00 pm is no easy task. But meeting our customers and agents directly, made the time fly by. Hearing first hand how our Roller Bar mixers produce bread and English Muffins and bagels and rolls all over the world is quite gratifying. And, hearing customers say, “I never have any problems with my Peerless mixer – it just runs” is a GREAT feeling! Knowing that the quality and care that we put into making each one of the machines that leave our building is appreciated really makes the job even more rewarding.